Buenos dias! Good morning! Today for What I Ate Wednesday I’m sharing the food I ate while on a weekend trip to Albuquerque to visit my girlfriends. I arrived in the 505 on Friday afternoon with an hour of time to kill before my friend got off work. So I went to Uptown shopping center which is right off the Interstate. I spent my time drooling over stores like Lululemon and Anthropologie. I also hit up the Trader Joes since I live no where close to one. I only got items that weren’t fresh nor would melt in my vehicle, so my choices were limited. 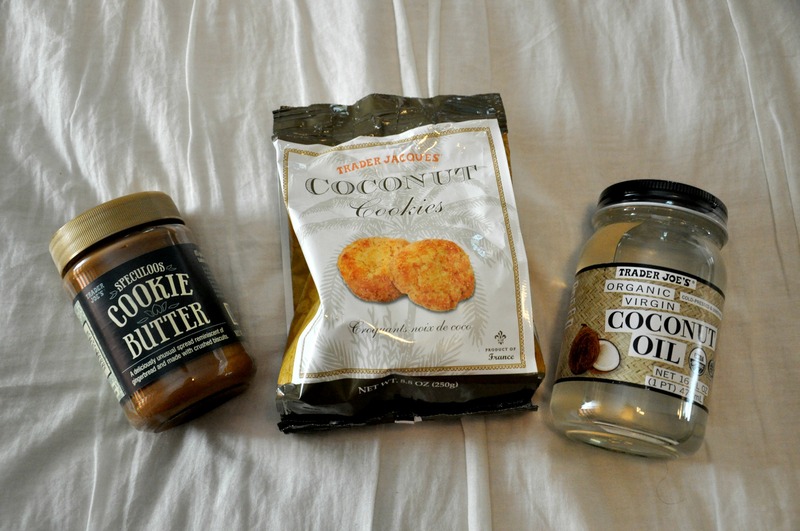 I picked up some Cookie Butter, coconut cookies, and coconut oil. I haven’t tried cookie butter before and wow is that stuff good! I don’t even know how to describe the taste. For dinner we wanted something light and quick before we went out and so we decided upon Chipotle. When we walked in the line went through about half the building and I thought that was long. Supposedly it’s common for the line to be out the door because it’s one of the few in Albuquerque. Our evening festivities began at Zacatecas with some margaritas and then the night rolled on from there! After a night out at Nob Hill, we were ready for breakfast the next morning. 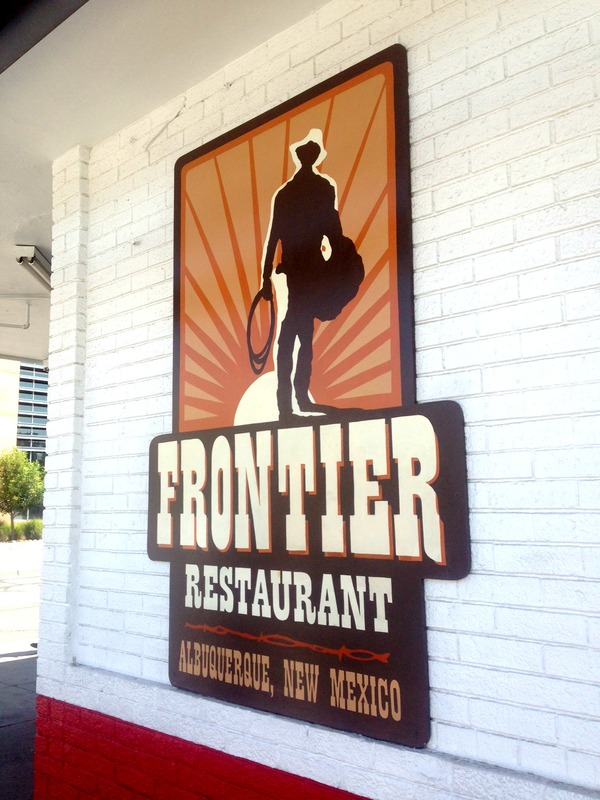 If you are familiar with Albuquerque then you would know that the Frontier is a must-eat place at some point if you visit. One of my ABQ girlfriends suggested we all try a cinnamon roll and man was I glad she told me to do that. 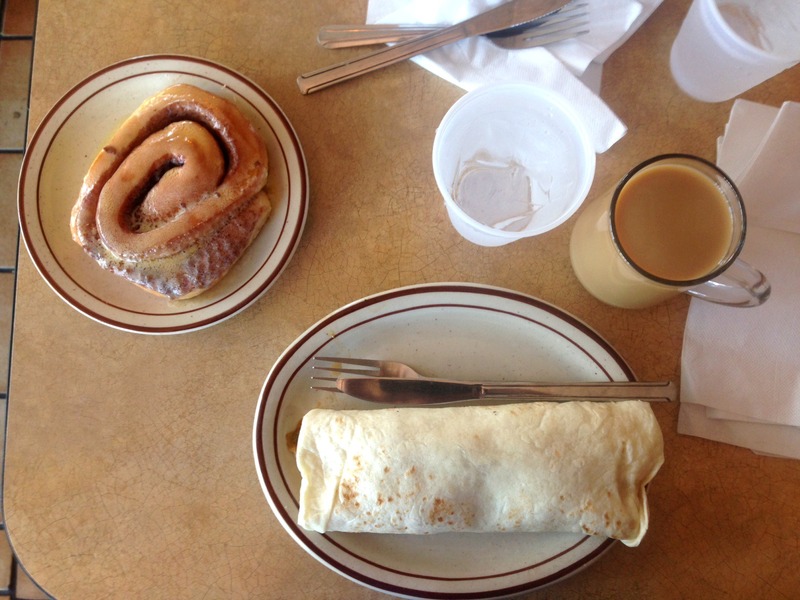 So I had a cinnamon roll along with my breakfast burrito filled with eggs, hashbrowns, and green chile. I was one happy girl after breakfast. 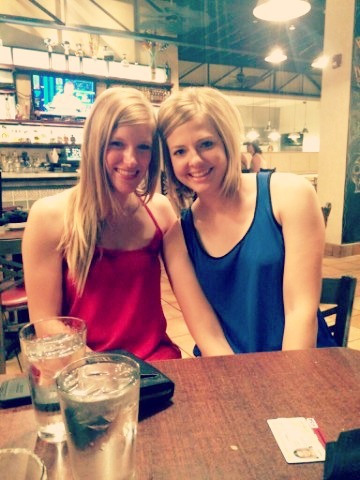 Saturday we spent the day shopping at the mall and went to Uptown again. 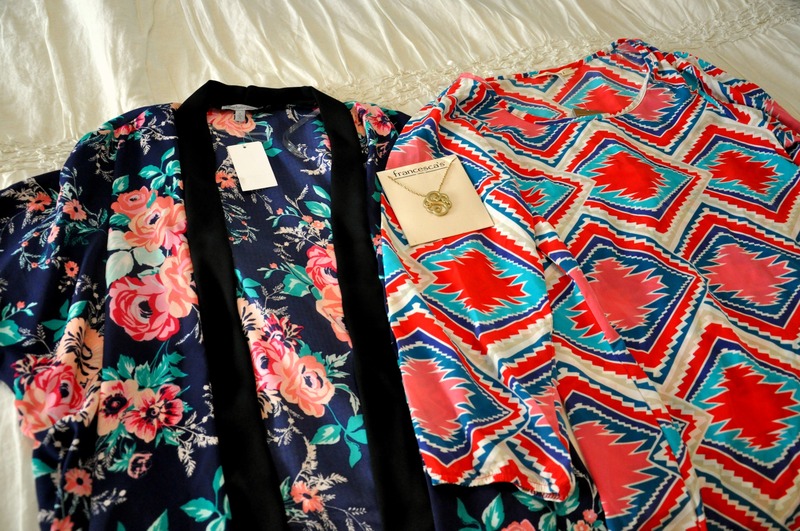 I had been wanting to find a kimono cover up with a cute print and I finally did at Charlotte Russe! At Uptown we into Francesca’s and I came out with this wild tribal print shirt and a faded gold monogram S necklace. I don’t know what got into me. Nothing I bought was black! It was pretty hot in Albuquerque on Saturday so we grabbed some fraps at Starbucks. 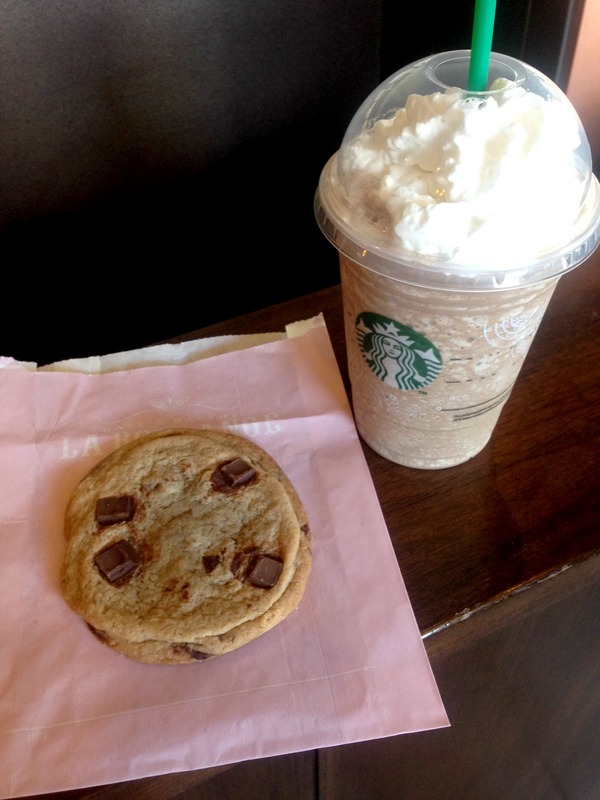 I got a mocha frap and a chocolate chip cookie. Definitely chocolate overload, but it sure helped us cool off. Next time I’ll choose one or the other. After a full day of shopping and a pick-me-up at Starbucks. 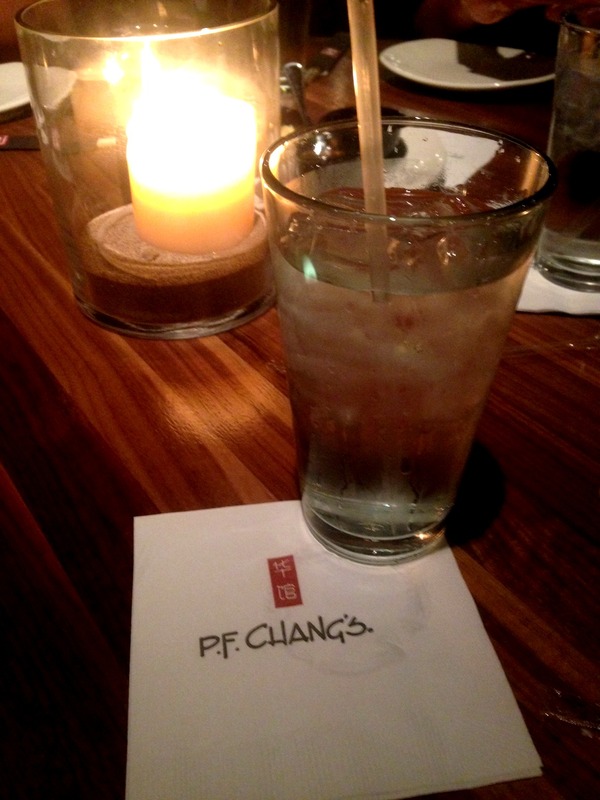 We were ravenously awaiting our dinner at PF Changs. Of course all 5 of us had to shower and get ready so by the time we finally arrived none of us were evening talking to each other due to being so hangry! And I didn’t get any pictures of the food because once it was out we inhaled it. We ordered California Crab sushi, Spicy Tuna sushi, and split the Spicy Chicken and Mongolian beef entrees with rice. We were still hungry after dividing all of that up between the 5 of us, so another California Crab sushi appetizer was ordered. That finally satisfied us. After another night out on the town we were ready for breakfast on Sunday morning. We all agreed on Weck’s. I ordered the papas bowl with scrambled egg, hashbrowns, and green chile. 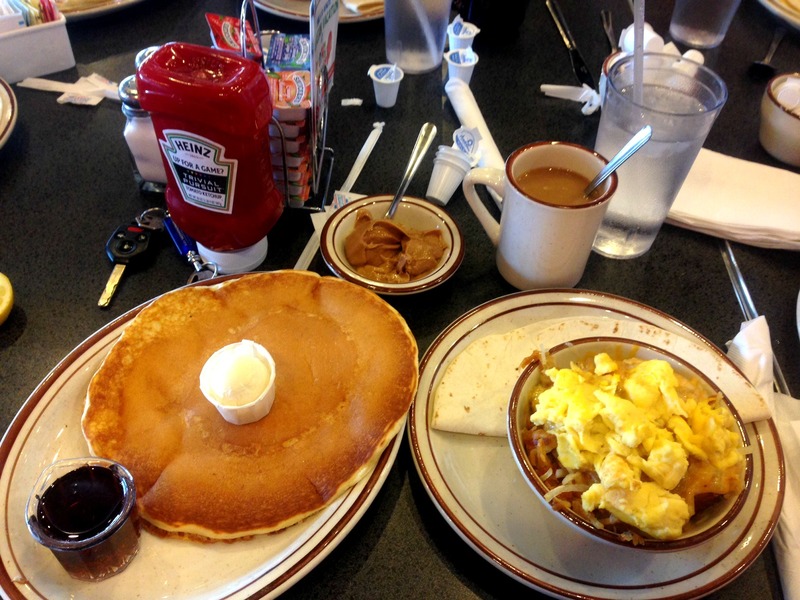 They offered peanut butter with your pancakes so of course I had to get a pancake too. Too say I was stuffed after breakfast is being modest. The papas bowl was soooo good and the green chile was perfect! The pancake on the other hand was so-so. Good, but not life changing. 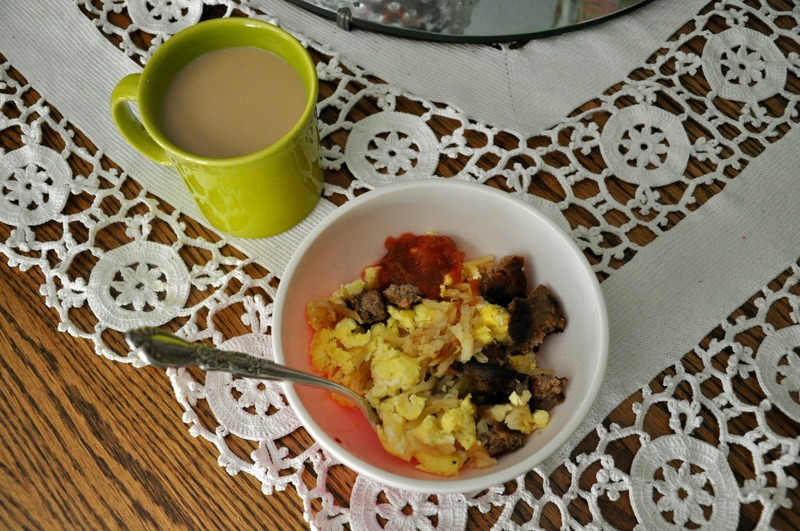 The leftover hashbrowns made an appearance on Monday morning at home for my breakfast with some sauasage and scrambled egg. Best breakfast I’ve made at home in a long time! And that’s all I have for y’all today on my weekend eats in Albuquerque! Do you like green chile? What have you been eating lately?